I signed up for an art course in November, to start in January. I’d been looking for a course for a while. I didn’t want to study painting. Or life-drawing. Or flower-arranging. So, I settled on an illustration course offered by the city of Ottawa. I bought my supplies the weekend before. I was excited. I was pumped. Then someone from the city called me a couple of hours before I had to leave for my first class. The course was cancelled; only one person had signed up. Me. At first I was disappointed. Then I began to think I might have dodged a bullet, so to speak. I mean, I hadn’t even picked up a pencil, except to correct English papers in how long? Since… ah…1974… at least. I used to love art. You might even say I was passionate about it. Drawing in particular. All my projects in elementary school and many in high school were illustrated, the drawings matted with contrasting paper; even the lettering was usually drawn on construction paper and carefully cut out and pasted on elaborate covers that had taken longer to prepare than the rest of the assignment. Sigh. I loved school in those days. At home I was always sketching. I haunted the art supply department at Zeller’s; imagine Zeller’s even having an art supply department, but they did. I spent my money on sketch pads, charcoal, oil pastels, books on how to draw cartoons, how to draw children, how to understand and appreciate abstract art. I dreamed of doing something artistic when I grew up. Not necessarily being a painter, painting had never interested me much, but maybe a fashion designer, an illustrator, or a graphic artist. This is some of the “art” I did in junior high. Girls, girls, girls, lots of girls in outfits. Some of them inspired by the Sears catalog, or by fashion lay-outs in Miss Chatelaine. A few portraits of historical figures like Pauline Johnson and Samuel de Champlain for school projects, and an attempt to render our Prime Minister when, as a twelve year old, I was deeply into Trudeau-mania. That’s my step-brother in the bottom right. I tried to copy his grade seven school photo, not entirely successfully, if you know what he really looked like. Then in high school things changed. I began to feel self-conscious that my work wasn’t good enough, and embarrassed, even, by the effort I put into it. I backed off… it was much more cool to NOT try so hard. I started getting lazy. In high school art class I really didn’t learn much. If I couldn’t master a skill quickly, I’d get frustrated, overly critical. I just wasn’t as good at art as I thought. And I gave up. Then other interests crowded in, and then university, and work, and life. Teaching was an engrossing career; I didn’t have time to resurrect old hobbies, even if I’d wanted to do so. Then I retired. And started trying to rekindle old passions that I had let fall by the wayside. Like art. So in early January when my course was cancelled, I was, as I said, disappointed at first. I began to look for another course I might like. But how to decide which one would be best for me? Gad! I slapped my forehead. I walk or skate most weeks with two friends who are… d’uh… retired art teachers! So, later that morning I spent over an hour on the phone with my lovely and generous friend Margaret, sipping tea and talking about art. Margaret studied illustration and commercial art, and created and taught the graphic arts course at my old school. I learned from her that illustration is much more complex than I thought, that I should probably work on drawing itself first. I had already begun to doubt whether I was ready to take the illustration course. Phew. Now I was relieved that the course had been cancelled. Margaret recommended a book for me to read. And then she volunteered to give me some art classes. See… I told you she’s lovely and generous. This is the book Margaret recommended. 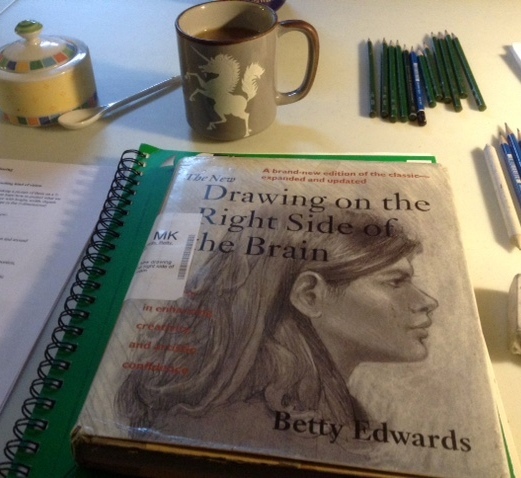 Drawing on the Right Side of the Brain by Betty Edwards. I ordered it from our library and right away started reading and doing the exercises as Margaret suggested. 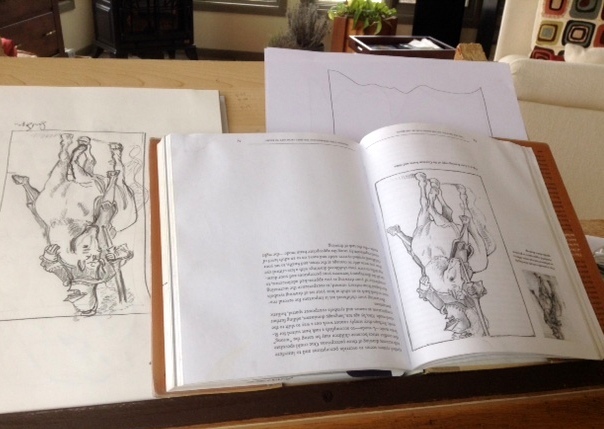 Edwards’ book works on the premise that anyone can be taught to draw competently. That learning to draw is really a matter of learning to see. And that seeing as the artist sees involves learning to consciously use our observant right brain, while at the same time learning to ignore our critical left brain. Some of what Edwards talks about in the first chapters of her book with respect to left-brain right-brain theory has been debunked since its publication. Creative, artsy types are not “necessarily right-brain dominant”, nor are “logical, analytical people left-brain dominant.” Neuroscientists at the University of Utah have since figured out that there is much more constant communication between both halves of our brains, and that there is no such thing as a predominantly right-brained or left-brained person. The new research does not deny, though, that certain functions we perform occur in one side of the brain or the other. You can read about that study here and here, if you’re interested. So Edwards’ claims that language and naming things is a left-brain activity, while seeing, observing, what the scientists call “attention,” is a right-brain activity are still correct. And the fact that we probably can’t “turn off” our left brain as she says, is really irrelevant. We can learn to focus, to observe, and train ourselves “to see” in order to be able to draw. Or at least I hope so. I’ve already been to one class at Margaret’s house. We were joined by Ron another former teaching colleague who, after a long career teaching History and Outdoor Education, wants to explore his more creative side, and by Brian, Margaret’s husband, a retired psychologist. Margaret was really organized, with a slide show and handouts. 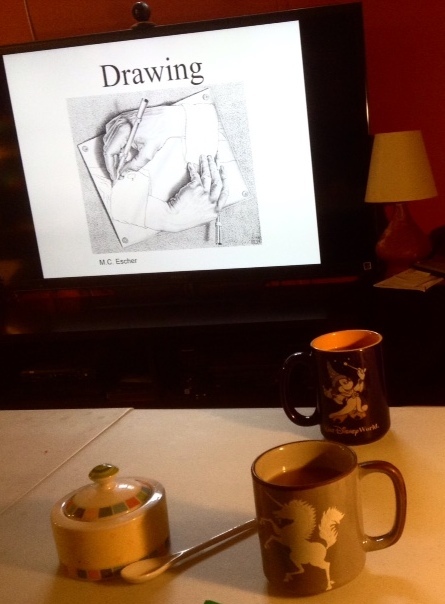 We had coffee and muffins and lots of interesting chat about drawing… and we even did some work. We’re scheduled to meet again this week. Meanwhile, I’ve been doing my homework. Hubby helped me set up a spot in a corner of our sun room as my “art space.” From the basement, we dragged an old desk that Hubby had refinished and which I had used for crafts, making grape-vine wreaths and the like. 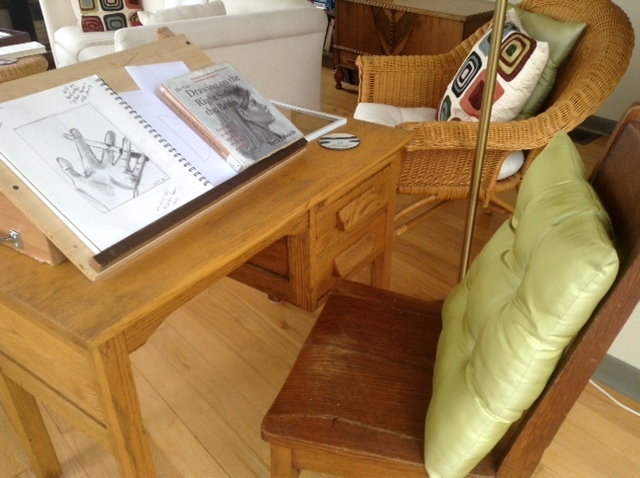 I’ve stocked the drawers with my supplies, my pencils and charcoal, and I use my homemade lectern to work on. Hubby built it for me years ago when I started having back problems from too many years bending over my marking. My “new” artist’s desk. Ssssssh, genius at work. Ha. The view from my desk today. I’ve done some weirdly interesting activities. Like upside down drawing. Trying to replicate an upside down line drawing, when although you can see what the drawing is overall, when you start to replicate the detail, you can’t really tell what parts are what. I mean even though you know it’s a horse, and you know what a horse is supposed to look like, you’ve never drawn one upside down, and that, my friends is a ‘whole nother thing.’ So you just focus on recreating the lines and spaces exactly as you see them. Or as best you can. A horse is a horse is a horse, unless it’s an upside down horse. It has not been easy to slow my mind down, to concentrate only on the task at hand. Usually only reading, or writing can achieve that for me. But if I set aside the time, and think… I’m just here to do this, and nothing else, it helps. The hardest thing by far has been to shut down that critical part of my brain, that judges, and sneers, and grows impatient, and tells me to just give up. My drawing skills are very, very rusty. Creaky, even. It helps to be just doing “exercises” and not “drawing” or, heaven forbid, creating art. I tell myself I’m just practicing, it’s not supposed to be any good. This morning’s activity. Modified contour drawing, to the sounds of Adele. As I work my way through Betty Edwards’ book, I’m reminded quite frequently of activities I did with my creative writing students. Games to get them to explore ideas, to practice playing with form. Activities to encourage them to be more observant, and to see and then try to describe the world around them. Drawing pictures with words, as it were. And I remember my admonishments to struggling students to focus on improving their skills, no matter how much or how little skill they had to begin with. Huh. The shoe is most definitely on the other foot now, isn’t it? This morning after I’d finished my drawing exercise, and sat at my desk, finishing my cup of tea, and gazing out the window at the river, I was reminded of my post last week on happiness and gratitude. Yep. I sure felt both of those. So even if I never recapture my youthful artistic fervor I will still have gained much from my artistic endeavours. Even if it’s only learning to tell my inner critic to shut it… occasionally. PrevPrevious storyHappiness Is … What Exactly? Interesting post Sue , we never know what to expect from you . I've always had a little artistic streak too , with the emphasis on little , it was the art master that took me in when the games mistress could see she was fighting a losing battle . I think your artistic streak is reflected in the way you dress – you just know what looks good . Not a skill everyone has or even wants . I like to do some sketching but I'm lazy & it does take real effort , as you know . The art apps can be fun but there's nothing like the smell of charcoal & paper – now where did I put it ? I love the variety of your posts. You make them all interesting. And this one particularly resonates with my creativity-deprived self who has wanted to learn to draw! Oh yes, the inner critic is always there. The problem is trying to tame him. I took up sketching in my old age when I finally realized it is a Learned Skill, not a Talent that you either had or did not have. Took me all my life before I realized that. The book you are using is great but you might find another fun book interesting: The Creative License by Danny Gregory. A wonderful book which will get you sketching in your everyday life. Isn't it great that we can discover and learn as we get older? I will definitely look out for the book. Thanks for the suggestion. I have never been able to overcome the idea that it is more cool to not try so hard. I know it's not true but I just, well, admire effortlessness. So I guess my inner critic evaluates the output in relationship to the input. I loved to draw when I was young too. I do have a sketchpad and pencils in my post-retirement activities pile but I have not gotten past the 'read all you want!!!' stage yet. Ah yes… that "read all you want" stage…been there. And now after too many years reading books that I didn't enjoy …for my job or for book clubs… it's morphed into read all I want, and only what I want. Enjoy the stage, Georgia! Oh how fun! You are not alone. Mater has taken painting classes, I am drawing little things in colored pencil, I think it's wonderful that we are revisiting, (some more seriously than others of course) that time of innocence and happiness with art. I had a similar experience in my youth. Lots of painting, drawing, calligraphy, ceramics, crafts..etc. I was never as accomplished as other kids in my class. It didn't come easy to me but I stuck with it for several years until my inner critic took hold along with child rearing and a full time job. I have tried to rekindle my interest often. I buy art supplies constantly in hopes it will stimulate me but they sit in a box barely used. I have the Right Side Brain book in my library. It has survived several Marie Kondo book purges. I'm going to look at it again. On a related subject, my husband does not read music. He plays guitar and piano by ear. I used to think he was born with this talent. He has always disagreed. Eventually I understood that he practiced non-stop for many, many years in his youth. My path has been, sort of, the opposite. I drew in school; I colored; I did some sculpture etc etc. But it wasn't really encouraged by my family: no, time to get serious and really "study" something useful. So I went to a prestigious university and studied, only taking one drawing course. But then, in the summer of my junior year, I worked for an interior designer as her assistant. I fell in love. That was it…well, the beginning of "it." I got sidetracked for several years, but then at age 26 went to design school and got my first job in a textile design studio. And the rest is history! But, even now, semi-retired with lots of time to travel, entertain etc I am still at it. It is my life. Husband and I are both in the arts and it has become a way of life. So I say, do it and enjoy it and yes, it is never, ever too late! That sounds like a dream job. I would have adored to do something like that… but I was too afraid to take the risk. So yes… I'll keep trying. The lack of pressure to produce something that will be evaluated by others is freeing for me. This strikes such a chord… and I am so happy for you that you found a workable way to draw again!, and to get back into the daily process… that can be so very important. I have used Betty Edwards' book and it is a good one! Thanks for that Suz. It's amazing how many people I've met and talked are familiar with her book. It's amazing how much I look forward to my "lessons" with Betty.. and my classes with Margaret. Sue, This is so inspiring, and timely. As a kid, I looked forward all week to art class on Friday afternoons. That came to a screeching halt in high school when the 'serious' academic subjects took priority, and the students who chose to take art were obviously more talented. One of the most unfortunate trends of the modern art movement was the notion that art was a product of genius and not a teachable or learnable skill. I think that one of the best things about growing older is the release from the imperative to be successful/the best at something in order to make it worthwhile: the pleasure in the doing is a good in itself. Now that I am among the cohort of older unemployed women of whom no one expects anything significant (well. except for Hillary Clinton), I plan to follow your example and will look for Betty Edwards's book. One of the frustrations of trying to get back into doing something like drawing which is such a departure from what I consider my normal "skill set" which includes analysis, talking, organizing, assessing…all the things that teachers need to be able to do. 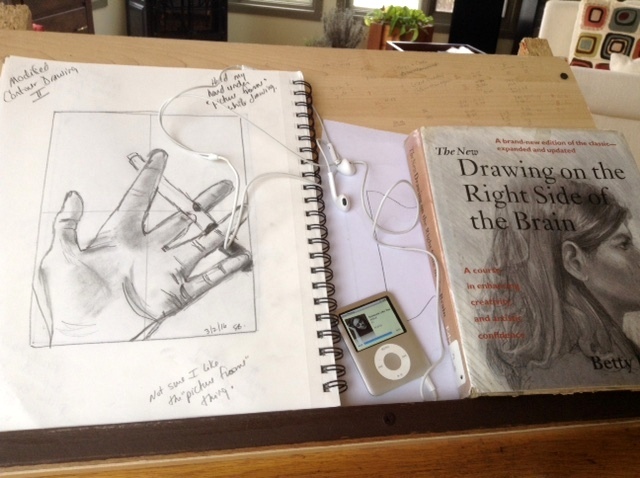 Drawing is "just" making your hand go where you want it to go, to replicate what you are seeing. And that's something that is way more difficult than I thought it would be. Even when I talk to my hand sternly, it doesn't always do what it's told:) I'm finding Edward's book really interesting, and unlike a class where you have a live teacher, if a certain "exercise" doesn't work for me, I just move on. I'm the boss. Love that bit. Thanks, Sue. I'm really enjoying my old-new interest..now that I don't worry so much about making it perfect. There must be something in the air: at the beginning of the year, I decided one of my intentions for 2016 would be to bring drawing and painting back into my life. 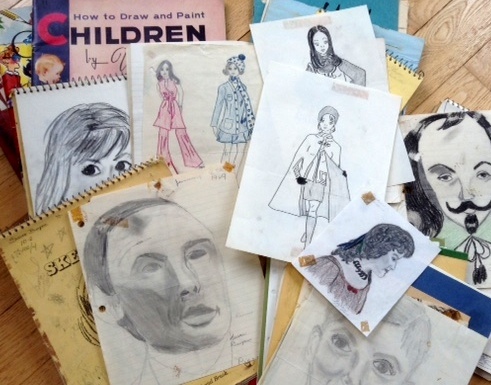 Like you, I drew constantly as a child, and throughout my teenage years. It was a great source of happiness. I continued a bit through college, but then career, husband, children and life got in the way….and here I am, turning 59, and deciding now is the time! I also had to ask myself "Why paint?" "Why draw?". We have cameras at the ready after all. I decided it was my way to really look at the world, and find beauty everywhere. Ultimately, I decided it was the process, not the product that mattered. And I no longer give two hoots about what anyone else thinks! With your love of writing, outdoor activities, and travel, you many enjoy keeping a sketchbook journal – writing a bit about your day, and illustrating it with small sketches of what you see…. (Moleskin sketchbooks are on sale right now at Chapters. I just might take my own advice.) There are many books about this available right now, plus information, (and inspiration) online. I was given art supplies for Christmas, As of today, I have painted two pictures. And it feels very good indeed! I know what you mean about photographs… but now that I've started drawing (emphasis on starting) I'm itching to draw some of the scenes that I've taken photos of… as practice. That's a good idea about the journal. 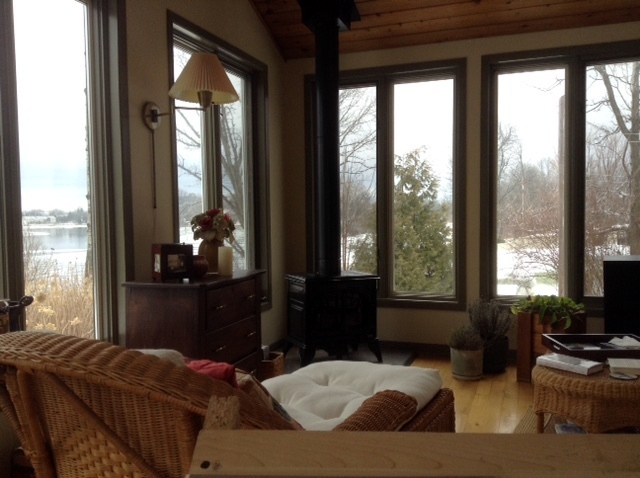 I do keep a journal and the last time we went fall camping, I sat on a picnic table overlooking the deserted campground beach and tried unsuccessfully to sketch the lake and the trees to accompany my journal entry… I'd almost forgotten about that. Maybe I'll be more successful next time I try. Please keep going with your art lessons, and journaling your afterthoughts as well. It is an inspiration and encouragement to likeminded followers. I read Drawing on the Right Side of the Brain years ago and even started some of the exercises but life and family and work soon got in the way. I have replenished my art supplies and will get my own copy of the book and try, try again as well. Thank you for not dusting, keep it up! That made me laugh, Wendy. You're welcome. It was a huge sacrifice to give up cleaning for drawing… but I go the extra mile for my readers. Ha Good luck with your own readers. I've used that book and loved what it did for me to just try to see with an artist's eye. To recreate what's actually there. I stand in awe of people who are naturally artists – like can get after it from a young age. That doesn't come naturally to me. And I think I got about half way through the book. You've inspired me to get it out again. I've been keeping a sketch a day journal that I don't think I've opened for about 60 days. In a watercolor class I took, the teacher pointed out that we have to be consistent in practicing. Want to be a good golfer? Practice. Pianist? Practice. Actor? Practice. The take home message? You guessed it – practice. Good for you for setting aside the time each day and really committing to it. I'm going to pull mine out again (they were never as good as yours in these pics). I know, I know, I shouldn't say that or compare – but seriously. I'll pull out my little sketch a day journal and just play. Thanks for the inspiration.